FileZoomer beta .6 has been released and it can now generate a report that shows the total amount of storage you’re using in an Amazon S3 account across all of your S3 Buckets. 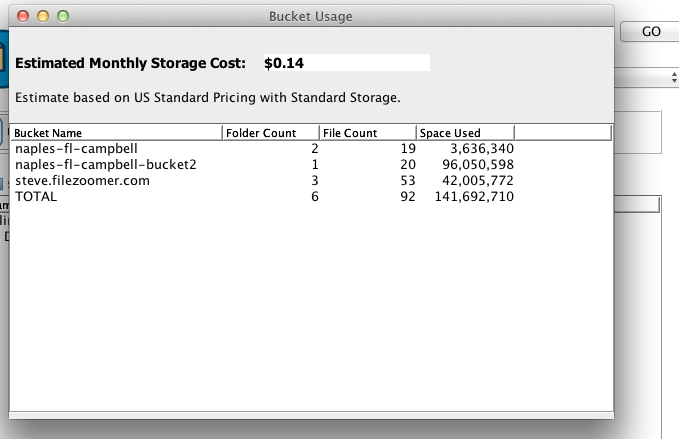 We’re also providing a high level estimate of the monthly cost of that storage from Amazon. The estimate uses US standard pricing and is based on standard storage costs so it may not be accurate for your particular location but it should provide a useful estimate. To generate the report from within FileZoomer just click the menu item for view and then the usage report. Click the menu item for view, then click "usage report"
The resulting report will look a bit like this, but hopefully you are making better use of your S3 account than we are with this test account. As you can see this test account has only a few files and folders and contains only 141,692,710 Kb of storage, or less than 140 MBs. Let us know in the comments if there are any questions on how to use the report, or if you have any suggestions on improving the it..